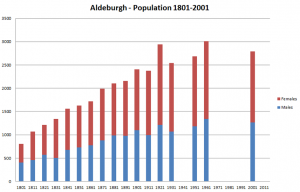 The following graph shows how the population of Aldeburgh has changed since 10-yearly censuses first began in 1801. The following table shows the actual population figures, subdivided between males and females. The ratio of females to males is one of the highest in Suffolk. Lucky fellas!